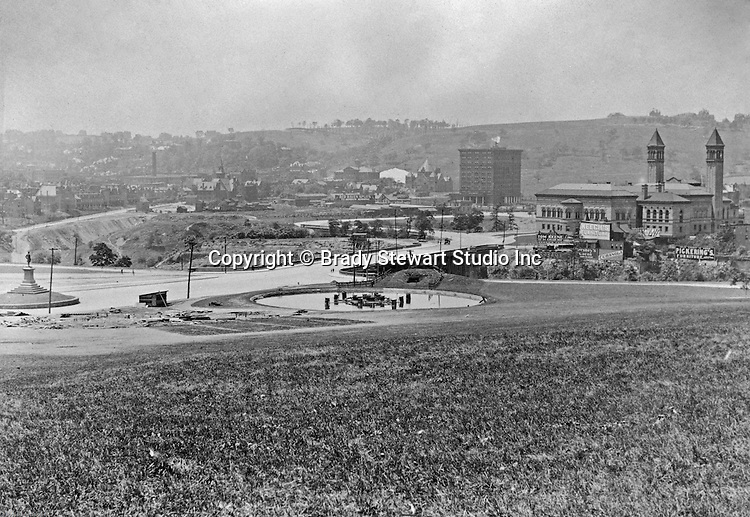 Oakland Section of Pittsburgh: View of Schenley Park, Schenley Bridge and the Carnegie Institute from Flagstaff Hill - 1907. Image includes the statue of Edward Manning Bigelow, Director of Public Works, and the Electric Fountain, bottom of Flagstaff Hill. The Carnegie Institute (Library) is located to the right across the St Pierre Ravine. The image includes the Schenley Bridge which was built in 1897 by architect Henry Rust. Company signs near the Institue include: Keech's Furniture, Hershey's Cocoa, Tom Keene Cigars, Pickerings Furniture, Cubanola sheet music and Red Raven Splits.